Northern bites svn commits 2005-10 through 2007, originally uploaded by northern_bites. I did some analysis of the svn log files, and came up with an interesting graph of the number of commits per day over the past 2+ years. I also found that there have been over 25 people who have at one point contributed 10 commits or more to our code base. Note the pyramid/triagles which lead up to each of the robocup’s, and then subsequently die off quickly. Not surprisingly, Henry has logged the lion’s share of the commits, with a total of 1158 commits, followed by Jeremy (371), Me (360), Chown(252), Admin(239), George(217), Tucker(162) and Nick(157). Though it’s stupid to measure quality of code soley by number of commits, the numbers certainly correlate well with how long each member has been on the team. Also, the Admin user’s commits are probably split between Henry and Jeremy, so Jeremy probably has many more commits than me. Edit: The numbers I originally posted were wrong. They have been replaced by the correct ones. 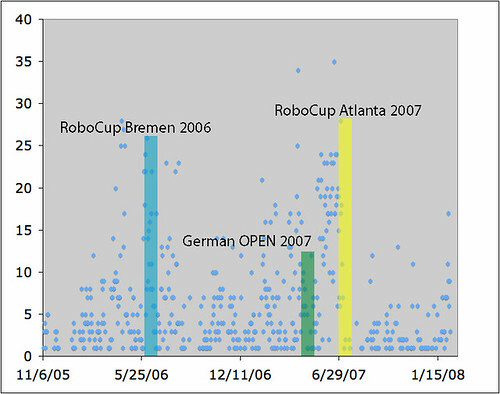 This entry was posted in RoboCup on February 10, 2008 by Joho. This is awesome. Joho for the win! However, I dispute these numbers. Where do you get 4822 commits from? There are only 3000-something changesets according to trac. Good point. That does seem a bit odd… I striped the date and user stamp from the svn log for the whole /svn/ directory (using a C script), and then counted the number of commits per person and per date (using a python script). I’ll post the code in ~jstrom/svn-count.zip if you want to take a look. Yup, I think I counted everything double. I’m fixing the numbers in the post. I counted double everything that was committed to the trunk, and once everything else that was committed to the whole svn/ repository. Although, the numbers I corrected still seem wrong. I think I screwed up how I used fscanf to read in from the logs. I’ll fix it tomorrow. Yeah, by searching Trac changeset logs, I come up with 1158 for Henry, 362 for me 11 as ‘robocup’, 370 for Joho, 252 for Chown.